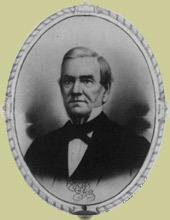 John Ross, principal chief of the Cherokees from 1828 to 1866. Photo by O.W. Osborn. Library of Congress, Prints and Photographs Division, LC-USZ62-93135. Black Seminoles accused of aiding the "Cherokee slave revolt"
It didn't help matters that Coacoochee's black allies were angering other "civilized tribes." In November of 1842, Black Seminoles were accused of aiding the "Cherokee Slave Revolt," in which twenty-five slaves locked up their Cherokee masters and fled for Mexico. The uprising ended within two weeks when tribal militia captured the rebels on the Texas border. Feeling against the Black Seminoles ran high since the fugitives had lived near them on the reservation. As a result, in January, 1843, the Cherokees passed an act expelling all "foreign" blacks and free negroes from their territory.